As we survey the living members of the plant kingdom there is a tendency to think in terms of primitive and advanced groups and that one group represents the ancestor of another: a moss evolved into a fern which evolved into a conifer and so on until we reach the flowering plants. 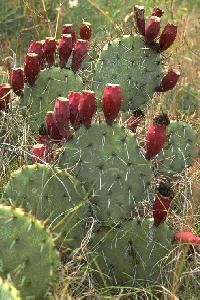 However the plants we see today are all descendants of fossil plants. If we wanted to see which plants were the ancestors of conifers and flowering plants we would have to go back in time to see the plants which were the common ancestors of both groups. Of course missing links constitute one of the objections to the theory of evolution. Without the fossil evidence all we can do is look at similarities between present day plants and try to figure out which are closest - which have diverged most recently. So we end up with a branching pattern of relationships with living plants at the ends of branches rather than at the branch points themselves. We can, however order the branches in the sequence of divergence and place significant developments along the way. 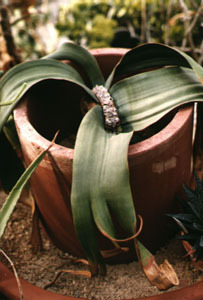 There are a few living plants which are intermediate between conifers and angiosperms - members of the Gnetophyta such as Wellwitschia mirabilis (right). However these are such peculiar plants that they must be the result of divergence from a common evolutionary path rather than "missing links". 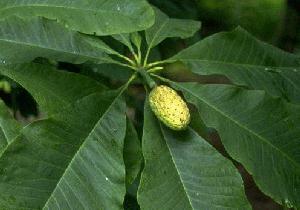 The most primitive angiosperms are in the Magnoliaceae. 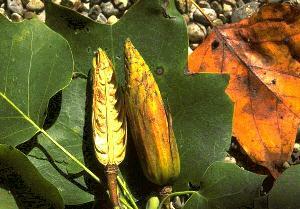 If you look at a developing fruit of Magnolia or Liriodendron it is not difficult to see it as a cone. Like the gymnosperms, these are seed plants but the seed is enclosed in an ovary, which is itself part of a specialised reproductive structure: the flower. Angiosperm means "seed in a vessel." 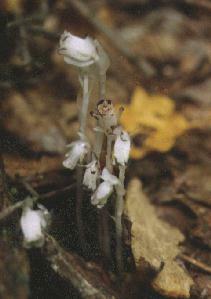 The vessel arose by the folding or fusion of sporophylls. The seeds are attached to a "placenta" formed at the edge of the ancestral leaf. Depending on how the sporophylls are folded and attached the placenta may end up on the outside or in the center of an ovary. the largest division of photosynthetic organisms - outnumbering all of the others put together. the dominant plants in most terrestrial ecosystems, (except boreal forest). plants with life cycles from a few weeks to centuries. 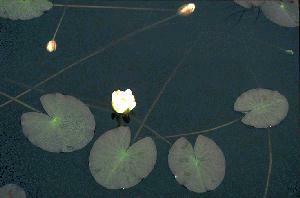 plants ranging in size from a few millimeters (duckweeds) to a hundred meters (trees). saprophytes and parasites although most are autotrophic. There are two classes of angiosperms - although they share more features than differentiate them. Whereas the other plant divisions have been around for up to 400 million years the angiosperms appeared, diversified and became dominant within the last 100 million. Something about them made them more successful in the exploitation of habitat and enabled them to evolve rapidly. Other plant groups acquired most of their basic vegetative features - vascular anatomy, leaves, roots, secondary growth, but none had a system of sexual reproduction as reliable and secure from environmental uncertainty as the flower. 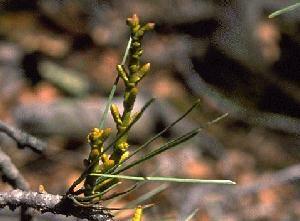 The flower is a shoot bearing sporophylls (as is a Lycopodium strobilus or a pine cone). Spores are produced by the inner two whorls of sporophylls (stamens and pistils) whereas the outer sporophylls (calyx and corolla) have become sterile and serve for protection or attraction. Anthers are not that far removed from the microsporangia we saw in Pinus and they are usually pretty similar among all flowering plants; but there are some important modifications of ovary arrangement and structure. The ovule represents the megasporangium (just as in the gymnosperms). But in angiosperms the ovules are enclosed by one or more sporophylls which are folded and sealed at the edges. The upper part of the sporophylls becomes the style through which the pollen tubes will grow to bring about fertilization. In the simplest flowers the parts are arranged successively - calyx, corolla, androecium, gynoecium (hypogynous flower, superior ovary). In some flowers (Rosaceae) the receptacle grows up around the ovary into a kind of cup (perigynous flower, superior ovary) and in others the other parts are joined to the top of the ovary (epigynous flower, inferior ovary).